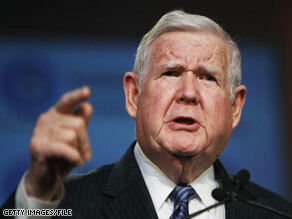 Rep. John Murtha said Friday that a major health care reform bill might not pass until January 2010 or later. (CNN) - A bill to overhaul the nation's ailing health-care system may not pass until January or later, Democratic Rep. John Murtha of Pennsylvania said Friday. His comment to CNN affiliate WJPA differed from President Barack Obama's repeated insistence that Congress will pass a health care bill by the end of 2009. Speaking in Bentleyville, Pennsylvania, Murtha said House Speaker Nancy Pelosi wanted a health-care bill passed before the current August recess. "She said we're going to have it before we left," Murtha said. "We said, 'No, no, we want some time to think about this.' We're taking some time to make sure it's done right. I don't know that we'll get something done before January, and even then we may not get it done. We're going to do it right when it's finally done." There are deep divides between Democrats and Republicans over the health-care issue, and Murtha said more time is needed to come up with a solution that works. "We said to the speaker, the leadership, let's not rush this thing," he said. "Let's do it right, so we'll have a uniquely American plan, if the thing passes." Some town hall meetings on health care have erupted in emotional and angry debate, and Murtha said such a response is natural in uncertain times such as the current economic recession. "I understand why they're against it - they're worried it's going to harm their health care," he said. "But we're going to work it out." If the Dems have a filibuster proof senate and a huge majority in the house, then how are the deep divides between Dems and Rep. significant? Is it just possible that the Dems are divided among themselves? Geez, Murtha and Pelosi would be whining if the senate were 99 to 1 Dems. The Rep. just keep torpedoing things don't they ? Oh wait a minute, us Dems can still blame Bush for this can't we? Wake up party, or it will be back to the future come election time. The best time to begin socialized medicine in this country is not "later, after careful planning;" the best time is "never." We do not have the productivity from our citizens to support any program based on sharing. When your not the one starving or lacking health care I can understand Murtha's lack of urgency. If you put Murtha under a veil of ignorance and he didn't know he was a congressman with great health care benefits would he fill the same. I have health insurance but many of my friends and family do not. We've been waiting ten years for health care reform, so it's finally time to get health care reform done. If you know the answer to the question of what's needed what utility is there in delaying the response. I'm tired of politicians who find utility in being obstructionist to pander to those who have no clue about health care reform.